AAPS - Blood Perfusion Monitoring Using Machine Learning and a Phone Camera. Blood Perfusion Monitoring Using Machine Learning and a Phone Camera. PURPOSE: Free flap monitoring is important to ensure early detection of arterial or venous failure to facilitate salvage. This study tested the feasibility of detecting venous and arterial occlusion using a smartphone camera and pattern recognition algorithm. METHODS: Bilateral hands of seven patients were video recorded with various tourniquet pressures on one hand simulating no occlusion, venous occlusion, and arterial occlusion. The other hand functioned as an internal control. Video data resolved at an average iPhone camera quality of 33 fps was processed using the sci-kit learn library in Python to detect changes in color frequency between frames and then compared to the control hand. Comparing the test hand to the control hand allowed for the depiction of the “delta” that was sensitive enough to detect changes on a video without any additional augmentation. 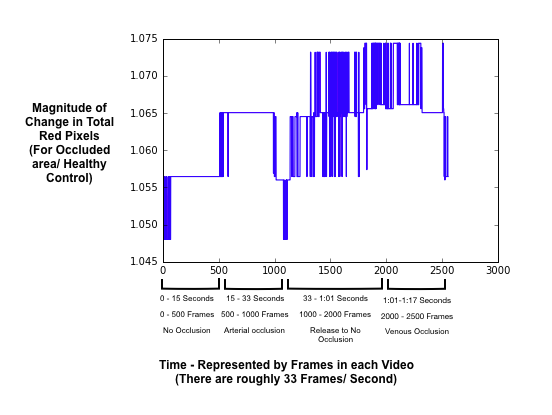 RESULTS: The average rate of change in red pixels between video frames was noticeably different compared to control for both arterial occlusion (1.06x greater) and venous occlusion (1.07x greater). A graphical representation of the data shows clear patterns of differential occlusion states (Fig 1). CONCLUSION: Our smartphone video capture and analysis facilitates visualization of skin perfusion and can distinguish between states of simulated vascular occlusion. This study shows promise for the use of inexpensive smartphone monitoring in a clinical setting for accurate free flap monitoring.